For a simple, easy, low-cost citybreak getaway,one of my continental favourites is the town of Bratislava. Even in poor weather, I find it a nice place to walk around and soak up some atmosphere, hang out in the cafes, and just relax. I didn’t include it in my top 10 European minibreaks (that would have make it a Top 11, eh? ), but I do feel it deserves a spotlight of its own. Several low cost carriers fly here, and you can find cheap accommodation and cheap beer – what’s not to like? It’s funny – most Germans, Czechs, or Austrians that I’ve met aren’t in love with the place, but Americans, Canadians, and most Brits are. I suspect it’s just a place that you’ll either love it or hate it. Here are a few highlights from my visit so you can decide whether or not it’s up your alley. Like any respectable old world town, Bratislava has its fair share of cute orange-roofed buildings and medieval architecture. 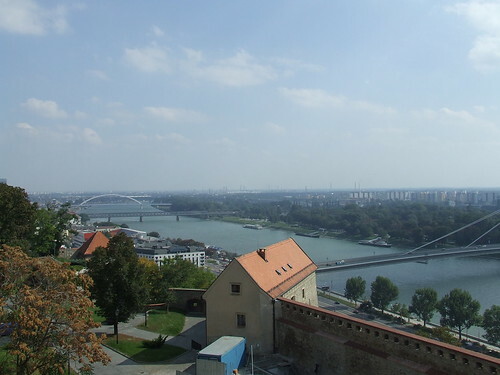 The two main highlights are the Bratislava Castle – currently under renovations but I am told will be open for the summer – as well as Saint Martin’s Cathedral. St. Martin’s is very interesting as it was a hive of activity during the reign of several of the Hungarian Kings, but history here starts all the way back in the 1200s. The church was renovated in the 1800s, so visiting here and just feeling all that history is certainly an experience in itself. There are plenty of other historic spots in the city, many of which have been repurposed from old uses into new. Saint Clare’s church, in the old city centre, is now a beautiful concert hall. There’s Roland Fountain, built in the 1500s as the first fountain in Bratislava. The presidential Palace is also very interesting – it’s a baroque palace and the beautiful gardens have trees that were planted by famous royalty from years gone by. Cafe culture is alive and well in Bratislava. Kofola is what you’ll want to try if you aren’t quite ready for a beer yet; it’s similar to a Coke, but lighter – I found it far more refreshing and perhaps a little more enjoyable. But whenever you’re ready, be sure to try some beer – there are a few breweries left in Slovakia, so you’ll be getting some tasty lagers at very good prices. The stag and hen crowd are very familiar with Bratislava’s good value party scene, so if that isn’t your scene, try to wander off the main streets for smaller, quieter establishments. The dining experience continues to evolve in Bratislava as tourism becomes more and more popular. While it is easy to find Slovakian snack food – sandwiches, little salads, garlic soup – there really aren’t that many “Slovak” restaurants. I prefer to pick less touristy restaurants here in Bratislava, because some of them, well, really you could get the exact same thing at home. Sure, I don’t mind a simple pizza now and then just to keep me going, but have a wander around the Old Town to explore your options – most of the pubs and restaurants in are in this area. Bratislava has its own airport which is typically the cheaper to fly into. Vienna is only about 25-30 miles away, and often the Bratislava airport is used as a cheap way to get to Vienna, but you could also go to Vienna as a daytrip, or if you happen to find a cheaper flight to Vienna, then you could fly there and take the bus to Bratislava, though Vienna is huge and worthy of a trip all on its own. Have you been to Bratislava? Did you love it, or hate it?